You may be very surprised the serial number of the 1968 GT500 KR press was only recently discovered. Thanks to the hard work of Vinny Liska at the Shelby American Automobile Club the number is known. A careful examination of the Ford warranty records led to the discovery. Over the last several years the Shelby Club has been rapidly expanding the information on the 1968 Shelbys. The plate shown above is a Michigan Manufacturer's plate (denoted by the "M"). 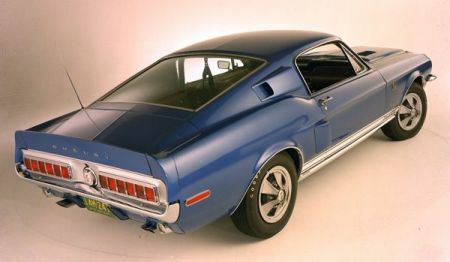 When it was time to announce the new GT500 KR, a beautiful Acapulco Blue car was chosen. If you look closely you will notice a saddle interior. The car is automatic transmission car. Those items along with the identification of the license plate led SAAC to find the serial number 8T02R204164-02356. Acording to the 1997 Shelby American World Registy the car was shipped to a dealer in Rockford and heavily drag raced. If you are looking for records on your car, I highly recommend you contact SAAC. Warranty records are now available for many cars. If you have seen # 2356 recently, shoot me an email.